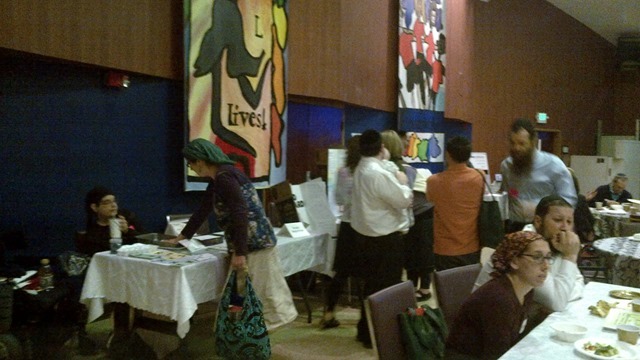 This year, the world’s only homeschool conference geared exclusively to Torah-observant Jewish families (it’s a small world) is happening in a new location in Englewood, NJ on Sunday, May 25, 2014, all day, from 9 am to 6 pm. There is tons of excitement planned all day long, including sessions by great home educators (Avivah Werner, Yehudis Eagle, Yael Aldrich and so many more), great topics (workboxes! limudei kodesh! special needs! husbands! ), a teen panel, rabbinic perspective, and… well, check it out for yourself. I admit, I really liked the previous Baltimore location, set in a friendly JCC in the midst of a warm community, and I’d definitely miss being able to eat out at David Chu’s China Bistro, where I stopped in after the conference the last 3 years running – the first year with a friend, the second year with the big kids, and last year, with Naomi Rivka. But it would still be worth the shlep. So if you’re anywhere nearby… book a bus, a train, a plane, a bike, and head on over to this page to preregister for the 2014 Torah Home Education conference. Tell them I sent you… and maybe I’ll be watching over the Internet. Tough concepts our kids can handle.